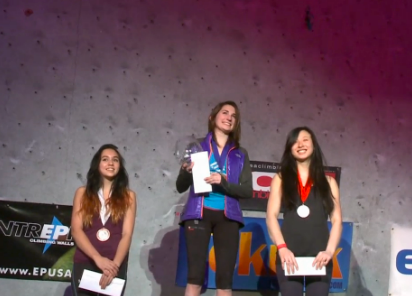 After a whirlwind evening that saw 20 competitors test themselves on their respective finals routes, Charlotte Durif and Daniel Woods emerged victorious at 2013 SCS Nationals. For the women, visiting French climber Charlotte Durif showed emphatically that she is one of the best female climbers in the world as she fluidly moved up the women’s finals route for its only onsight. Delaney Miller took National Champion honors by virtue of a truly impressive 2nd place performance that saw her fall one move from the finish. Rounding out the top three was Chelsea Rude who also made it near the end of the route before spitting off. Last year’s defending champion, Sasha DiGiulian, never seemed in top form the entire weekend and finished in 9th position. 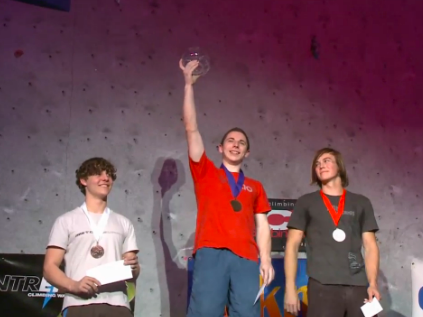 On the men’s side, Daniel Woods recovered from an uneven qualifying round to nearly top out the men’s route and claim the crown of National Champion. 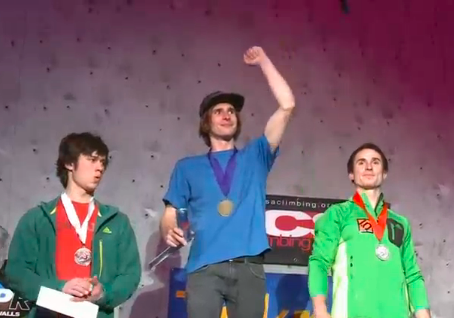 Woods becomes the first person to be ABS and SCS National Champion in the same year so a huge congrats to him. In 2nd was Carlo Traversi who backed up his strong qualifying performance with a solid performance in finals. Rounding out the podium for the men was the young darkhorse Noah Ridge who I expect you’ll be seeing for many years to come in events like this. Last year’s champion, Vasya Vorotnikov, finished in 5th. On a more serious note, way to go Daniel. The guy is crushing both major US competition formats. He really does hold everything like that, kinda funny. We we’re talking about that in ISO before Finals. I bet it comes from bouldering so much in the higher areas of RMNP. The glacially polished stone there can be really glassy.. i felt myself “overgripping” everything there to avoid slipping off due to low texture. Dang! Daniel is getting to be a CRUSHER! Cool to see Carlo right on his heels too, both here as well as ABS. Also, what happened to Sasha Diguilian? I didn’t really get to see her climb. 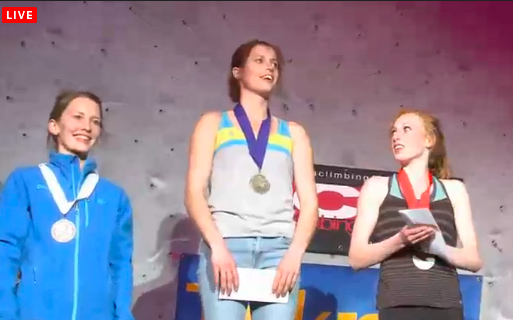 Was the women’s field super stacked and she had a bad day of climbing or what? I was quite surprised to see her come in so low. I’ve just heard a rumor that Woods was actually disqualified. Does anyone know about this? Pretty sure he wasn’t dq’d.. the final results are in and the comp was 2 days ago.. 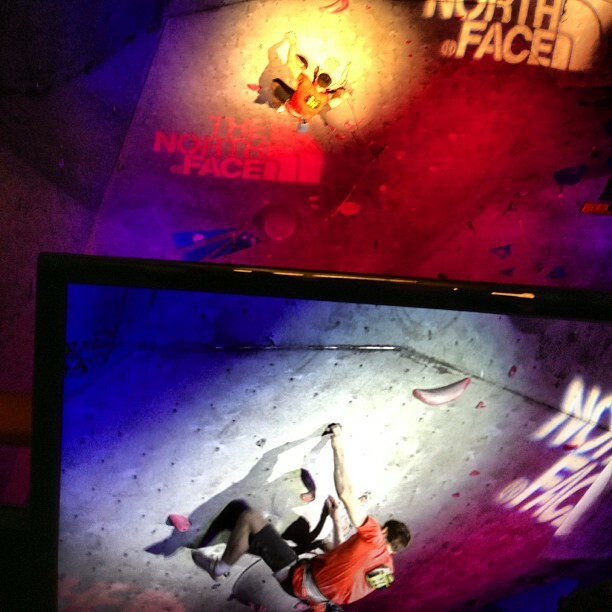 He had a technical incident on his 1st qualifier on Friday that required him to reclimb that route. But I haven’t heard anything about him being DQ’ed. I believe that technically, he was actually DQ’ed, but an appeal was filed and he was allowed to re-climb the route. He failed to clip from the required hold- holds demarcated with a blue X require the climber to clip from or before the designated hold. Apparently Daniel was confused about this when the judge told him before his route. That’s what they were talking about. Thanks for the clarification. He was disqualified from the north face masters down in chile because he jumped from the top of one of the problema instead of going down the ladder. He missed the mandatory clip, was told to come down and didn’t, climbed the whole route then filed the complaint, then was allowed to climb the whole route again. He should have been scored to the highest point of the climb before the technical which would have seen him come up short of qualifying especial after not listening to the judge and lowering after the fault. He would have been DQ’ed in world cup for sure.